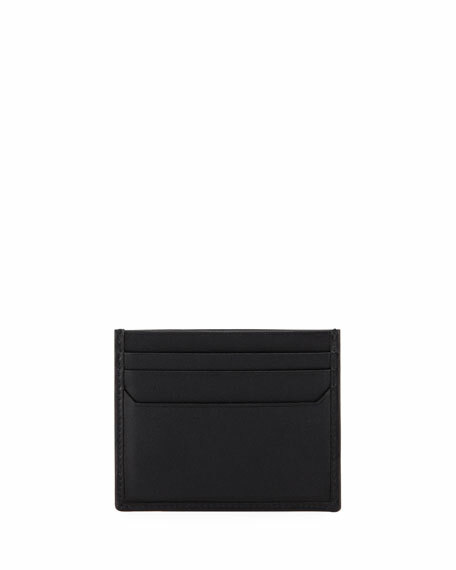 dunhill card case in grained calfskin leather, from the Hampstead Collection. Embossed logo stamp at front corner. 2.5"H x 4"W x 0.3"D.
dunhill diamond engine turn-pattern grained calfskin card case, from the Cadogan Collection. Silvertone logo stud in corner. One compartment; four card slots; two slip pockets. 4.5"H x 3"W x 0.5"D. Made in Italy. dunhill printed calf leather card case. Logo detail at bottom center. Exterior, six card slots. Interior, open slip pocket. 3"H x 4"W x 0.3"D. Made in Italy. dunhill bifold card case in textured goat leather. Logo detail at bottom center. Exterior, back card slot. Interior, five card slots. 4.3"H x 3"W x 0.5"D. Made in Italy.